The Army-Navy game is an American tradition and the greatest match-up in sports. At Freedom Alliance’s Army-Navy Weekend, we celebrate this rivalry as we learn more about America’s history, heroes and traditions. We honor two remarkable institutions – the U.S. Military Academy and the U.S. Naval Academy – and the leaders they graduate. Army-Navy Weekend is a 3-day event featuring our annual Defender of Freedom Awards & Benefit Dinner, educational seminars, tours and presentations, and attendance at the storied football classic. You’ll hear from dynamic speakers, visit amazing institutions, and learn more about the incredible impact Freedom Alliance makes in the lives of America’s military heroes. A celebration of America’s military heroes. Seminars featuring distinguished guest speakers, authors and experts with plenty of time for questions and answers. Exclusive receptions and personal interaction with conference participants. VIP accommodations at the Army-Navy Football Classic! Updates on Army-Navy Weekend are announced via email. Please register for our email updates. The 2018 Army-Navy Weekend is Sold Out! Arlington National Cemetery: Our group went to Arlington National Cemetery to visit our fallen heroes, many of whom left children behind who are now recipients of a Freedom Alliance scholarship. 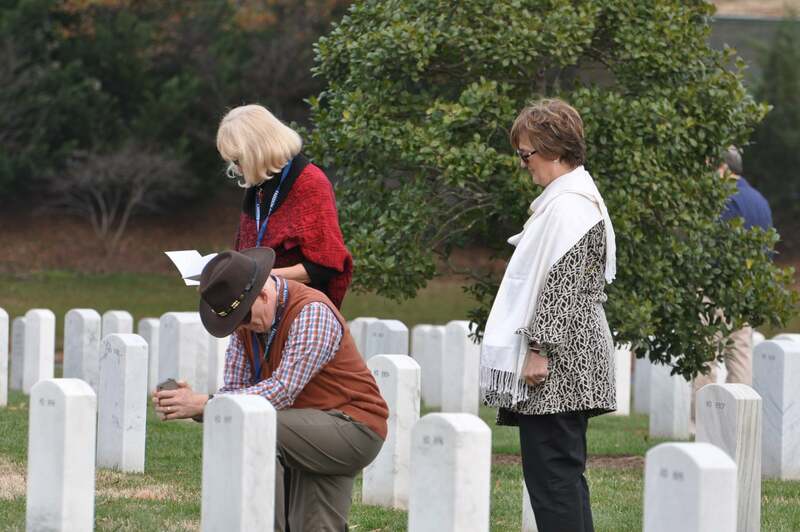 Once we arrived at Section 60, the resting place of many recent casualties, our guests were given a card with information about one of our scholarship recipients and their parent, and then asked to find the gravesites and pay respects to these heroes.